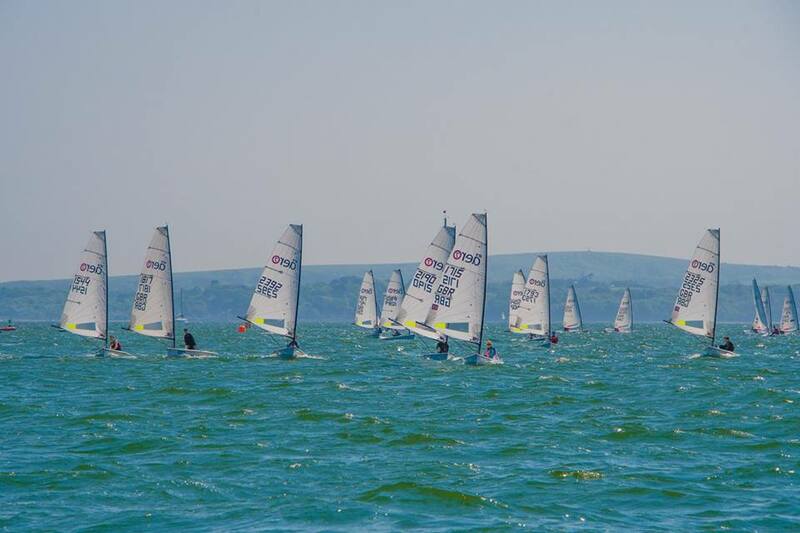 On a hot and sunny weekend a fantastic turn-out of 61 RS Aeros made it down to the South Coast to lovely Lymington for the UK Southern Champs. As always with Aero events it was set to be a good weekend of sailing & socialising, especially with your fellow reporters 21st birthday falling on that weekend! On arrival, he even got a surprise ‘champagne’ & cake presentation celebrating the amazing surprise present, of a brand new ready-rigged RS Aero #2600 from his generous parents! The fleets were Class racing in each rig size, the RS Aero 7s having the biggest entry at 30, the big boy RS Aero 9s with 21 boats entered and the pocket rocket RS Aero 5s with 10 boats. After a slight postponement, the Race-committee cracked on with the Race 1. A building sea breeze supplied the goods, starting off in 11-13 knots of wind. The 5s were first away with Kate Sargent showing the rest of the 5s the way round the course with superior downwind speed and a good set of hiking legs but with Sammy Isaacs-Johnson in close pursuit. Kate took the win, clearly a few months of no sailing hasn’t affected her performance! Hilary Baker sailed well to finished 3rd. Next up was the 7s, Steve Cockerill showed his world champion skills by piecing together a race-win followed by Chris Jones & Andy Hill 3rd. 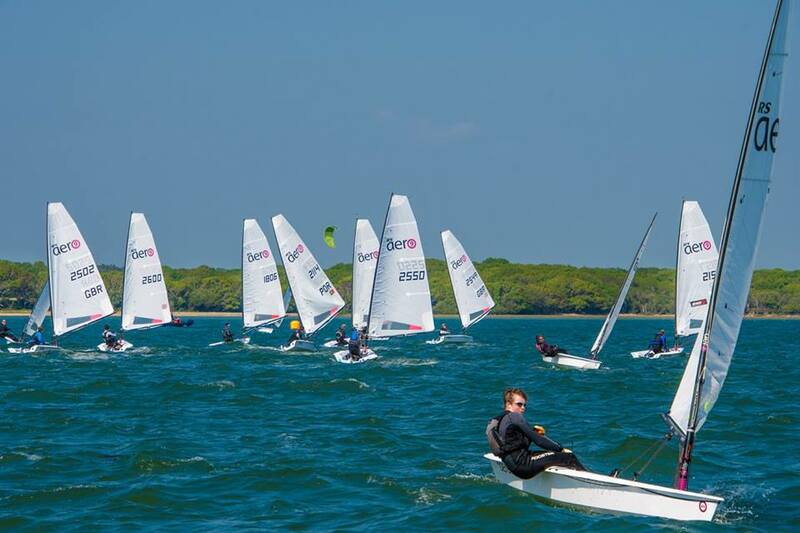 The 9s were last start, Liam Lightning Willis proved his nickname and stormed off into the lead never to be caught, Peter Barton clinched 2nd on a late surge through the fleet. The popular Rich Watsham taking 3rd. For the Race 2, the tide had turned and was pushing the fleet over on the line. In the 5’s once again Kate stormed off into the lead closely followed by Sammy I-J. In the 7’s it was local knowledge that paid this time with Lymington lad Dave Ellis taking a convincing win by the first run never to be relinquished, Steve Cockerill was 2nd and another local and all round nice-guy Ben George was in 3rd. In the 9s Liam Willis again stormed of into the lead, never to be caught, but unfortunately was OCS. This left Gareth Griffiths to take the win coming from the more tidal side on the run to over-take everybody followed closely by Pete Barton. For the final race of the day the tide had picked up some steam and was rocketing out at 3 knots against a building sea breeze. In the 5s Kate topped her perfect day by getting another bullet, this time followed by Lymo local and Florida State RS Aero 5 champ Julie Willis. Sammy I–J took third. In the 7s, Steve Cockerill showed his world champ ways again by winning the final race of the day followed by Ali Barker and Chris Jones coming back from 3rd after an OCS the race before. In the 9s Liam Willis, sped off at lightning speed again only to death roll when close to the lead with Pete Barton. Gareth Griffiths with Simon Maguire where in close contention with Gareth again taking a fast route around the outside of the lead pack! 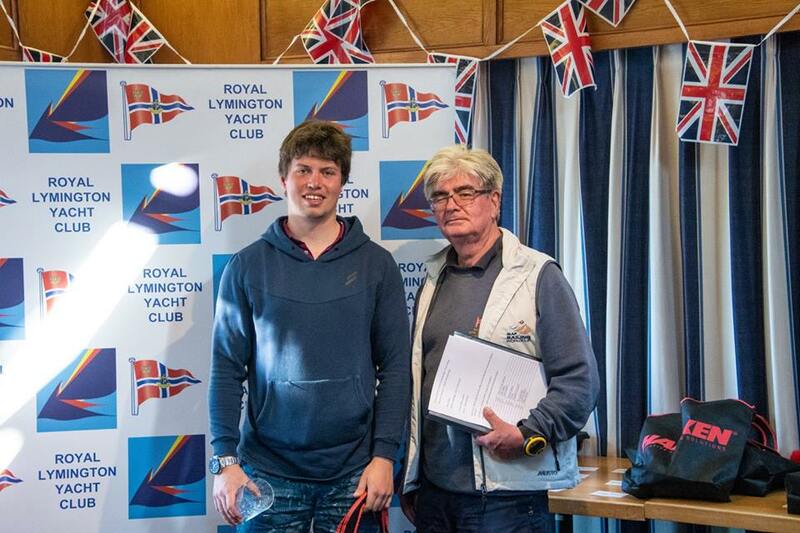 After racing, Royal Lymington YC put on a sumptuous BBQ, with most of the crowd ending up afterwards on a cultural tour of Lymington to celebrate Greg Bartlett’s 21st birthday and various challenges ensued! Some sore-heads and a lot of sun tanned sailors woke up to another warm sunny day in Lymo (with one Liam Willis deciding sleeping a night in a J/80 was a good idea!). This time greeted with lighter winds, Race 4 started off in 6 knots of wind creating very tight racing throughout. The 5s started & this time light-wind expert Giles Baker sailed off to victory followed by Ben Millard and then Saturday’s winner Kate Sargent. In the 7s, 2016 National champion and local legend Dave Ellis stormed off to another win, with Steve Cockerill in second and Mr Consistent Chris Jones in 3rd. Liam Willis again lead the 9 rigs, showing mega pace, proving he can sail supremely quickly in all conditions. However, he was challenged all the way by fellow local Nev Herbert in his new ship, with Liam just pipping him at the end & Greg Bartlett in 3rd. As the gradient wind fought the sea breeze, the wind briefly died down, but then resumed to 6 knots again. The 5s were off, where a pattern was starting to emerge, with Giles Baker again winning the race with Sammy I-J second and Kate Sargent third. Next the 7s, with Steve Cockerill making the most of his superior downwind speed with local Martin Sellars 2nd - swapping two hulls for one in his first RS Aero event. Youth sailor, Roscoe Martin clinched 3rd. In the 9s Liam again sailed away from the fleet (worth a bet for World Champion? ), your fellow reporter managed to make better use of his new boat and challenged Liam to finish 2nd, with Pete Barton taking 3rd. For the final race of the day the wind had finally built slightly to 8 knots and the tide had turned, with 2 knots pushing the boats back from the start-line, making for long upwinds and short downwinds. In the 5s, the pattern continued with Giles Baker winning the final race. Julie Willis sailed an excellent race, finishing 2nd with Kate Sargent 3rd. In the 7’s, Ali Barker took the race win with Steve Cockerill 2nd and Martin Sellars 3rd. In the 9’s Pete Barton and Liam Willis had the best starts followed by Neville Herbert and Greg Bartlett. Many boats in all fleets got stuck going out into the tide too early. Come the last mark, the wind shut off completely and with an ever increasing tide (3 knots at this stage) it was a case of who is first, shall be last! - Pete and Liam did their best to finish but struggled. The wind filled in just enough when Neville and Greg arrived for Neville to sneak line honours, then Greg who was closely followed by a late surge from Keith Willis. In the 5’s Kate Sargent took the overall win by 1 point over Giles Baker, with Sammy I-J in 3rd. In the 7’s Steve Cockerill was up with his usual form with a 11 point win over Dave Ellis with another local, Martin Sellars in 3rd. The 9 rig winner was Peter Barton, whose consistency gave a convincing 5 point win over Gareth Griffiths with Greg Bartlett 1 point behind in 3rd. Overall the Race-committee did an excellent job to get all 6 races in over the weekend, despite the challenging conditions & everyone enjoyed the hospitality & stunning location. Many thanks to event sponsors Harken for their excellent prizes. 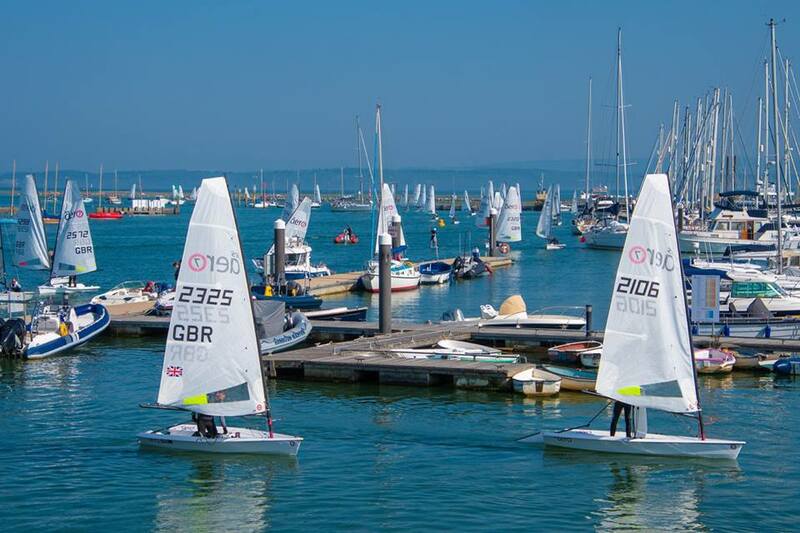 The next major events to look forward to are the UK National Championships at Abersoch (31st May-3rd June) and the World Championships at Weymouth where there is a massive 125 entry list already confirmed!!! - So get yours in quickly, if not yet signed up!. This weekend is the turn of the Northern Circuit at Ullswater in beautiful Lakeland whilst the next open events on the South-Coast are Felpham on the 9th June, with training on the 10th, and Lee-on-Solent on the 23/24th June.